Good Morning! Welcome to the Spring 2017 edition of Freaky Friday! I am so excited to be participating! This group is the brainchild of my friend, Michaela’s and it is SO MUCH FUN! For those of you that aren’t familiar with Freaky Friday, it is a group of food bloggers that get assigned a secret blog and we get to choose any recipe we want to make from it for our own blogs. Then all of the recipes are revealed at the exact same time and we get to see who had our page and which recipe they selected! It has been a great way for me and my readers to find new blogs to follow, and I feel honored to be a part of it! The hardest part of this assignment was narrowing it down to just one recipe. The first recipes that caught my eye were Crack Dip Crescent Bombs and the Skillet Mini Meatball Dip and you can BET they are both on my list to make SOON! But since Cinco de Mayo was last week (and I tell ya, we have been celebrating all month long I think! #CantStopWontStop), I decided to try out her Summer Corn Salsa. Oh my gosh you guys!!! We had it as a dip for tortilla chips, but also as a topping for some of our favorite Fajita Marinaded Grilled Chicken, and lastly as a dip for chicken quesadillas and I COULD NOT control myself around this stuff! So fresh, flavorful and perfect for the warm weather, grilling season! I hope you enjoy this one as much as we did! Mix all ingredients together and add salt & pepper to taste. Let chill in the fridge for a couple of hours or overnight before serving. ENJOY! Jennifer's TIP: If you are using fresh corn, you can cook it quickly by microwaving it in the husk. Just wrap the husk with a wet paper towel and microwave for 3 minutes. You can do up to 3 ears at a time. Once cooked, shuck the corn under cold running water to remove the silk. Then just cut off the cob. I love all of the fresh delicious flavors in this salsa and it looks amazing. I had Jennifer last time and am still dreaming of some of the recipes I swore I was going to make! I went a little crazy for Cinco this year and it could go another month and I wouldn’t mind! Love this dip and also that you used it to top off that chicken. What a yummy dip! This salsa looks so flavorful and fresh. Perfect for summer! This looks great! I would serve this with tacos, or it would also be delicious over grilled fish. Or, who am I kidding, I just want to eat it with chips! I love this!!! So versatile, bright, healthy and full of flavor! This is going to be a a new favorite around here for sure! 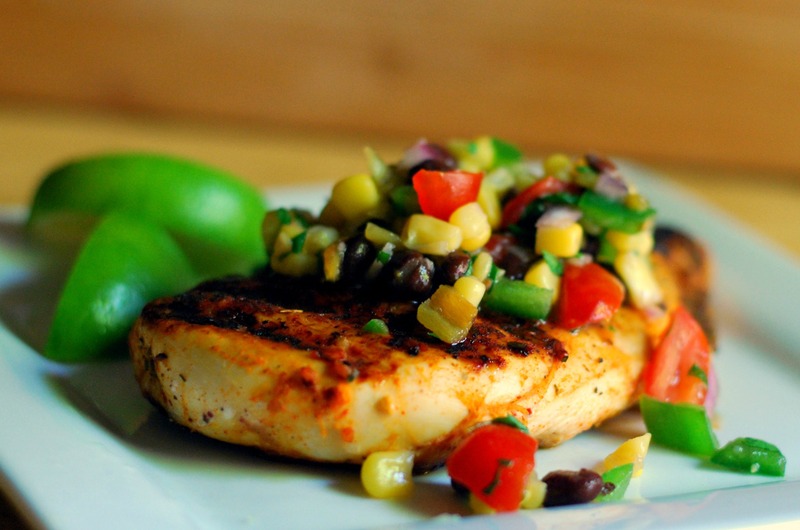 This salsa is all summer and all delicious; even more so with your pairing of chicken! Fantastic job as always!!! I love Jennifer’s blog too! I could think of about a zillion ways to use this salsa…I can’t wait for summer corn! 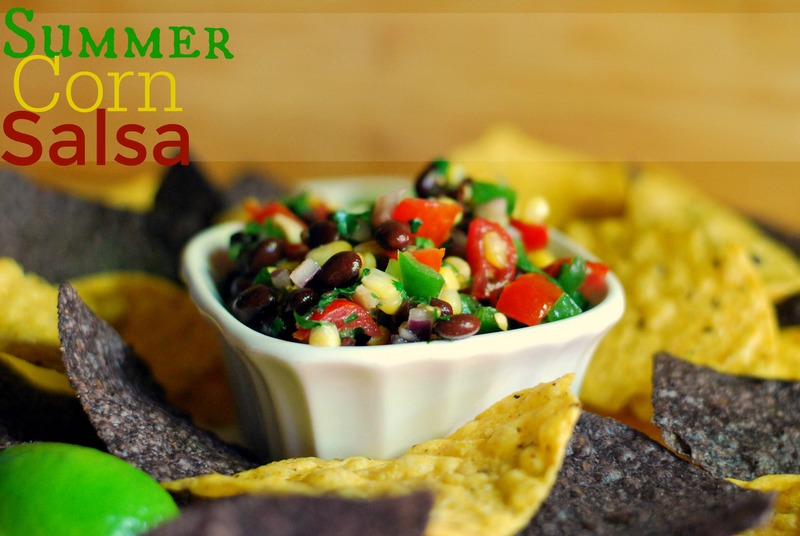 All the fresh flavors in this salsa go so well with so many summertime dishes! Love it! I wanna put this on EVERYTHING i eat! Looks insanely good. I drooled over her corn salsa when I first saw it. It looks amazing! I have to make it now. This looks CRAZY GOOD!! What a fantastic find! I can’t wait to make this!! We are having fajitas this week — guess what ELSE we will be having!? YUM!